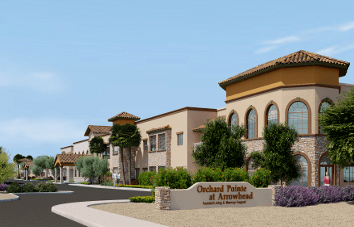 Heritage Communities is building its third senior living community in the Phoenix area. The Omaha, Nebraska-based owner and operator of 10 senior living communities in Arizona, Nebraska and Iowa, is working in partnership with Phoenix-based Telis Senior Living Inc.
Their partnership, called Orchard Pointe at Terrazza LLC, paid $3.4 million for 6.69 acres at the southwest corner of 67th Avenue and Happy Valley Road in Peoria, said Mark Huey, president of Telis, will be leading the development of the project, working with city officials and overseeing construction. Financing was provided by Great Western Bank in Omaha, said Huey, who represented the buyer in the land transaction. The project is east of Christ's Church of the Valley and will be part of the Terrazza Development. To be called Orchard Pointe at Terrazza, the retirement community will include 116 apartments, which includes 40 independent living, 54 assisted living and 22 memory care units. Reece Angle Rowe, the architect for the other Heritage Communities projects in Phoenix, has begun design work on the Peoria project. Construction is expected to begin in 2017 and be open in spring 2018. The first project — Orchard Pointe at Surprise — opened in 2012. The second location, called Orchard Pointe at Arrowhead, is scheduled to open in 2017. Both of those projects offer assisted living and memory support apartments. The Peoria project will be the 13th community for the company. Click here to read the article in the Phoenix Business Journal.